Home » Texas Rangers » Eventually. 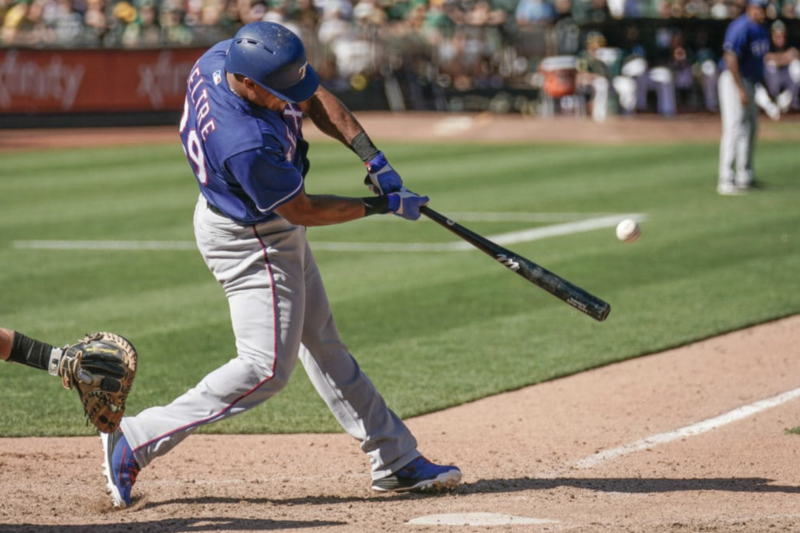 Adrian Beltre launches two home runs against Oakland pitching on Saturday but it wasn’t enough, as the Rangers lose 8-6. Eventually, you run out of places to hide Martin Perez. Under a rock under the deepest ocean floor on the planet furthest away from our solar system wouldn’t be far enough. But it would be a start. Eventually, Adrian Beltre will stop performing at an elite level. But, it seems, no time in the foreseeable future. The guy has hit five home runs in the last seven days. If he’s going out, he’s going out in true Adrian Beltre style. Eventually, the Rangers front office will develop pitching. They should be tearing down the new domed stadium for the new holographic stadium around that time. Eventually, this core of Rangers youngsters will finish a season over .500. I predict in the near future this team breaks the all-time franchise record for runs scored. And for runs given up. Eventually, the Rangers will value defense like the winning teams do. In the fifth inning of yesterday’s game, fans saw the difference between an organization that understands the value of defense and an organization that seems to be playing fantasy baseball with its players, where everyone can play everywhere. Oakland’s center fielder Ramon Laureano made one of the more impressive plays you will ever see to keep Rougned Odor from turning a double into a triple, and to keep Shin-Soo Choo from scoringn from first. In a nutshell (which, by the way, is a phrase you should never use around Mr. Peanut, apparently that’s offensive), defense is what wins games. Eventually, Khris Davis will stop killing Rangers pitching. By all accounts, that should happen about the same time Jerry Jones builds a play-off bound team. Which means, when hell freezes over. Eventually, this miserable 2018 season will put us all out of our misery and come to an end. And that will lead to an even greater misery: life without baseball. Proving once again the old axiom that states bad baseball beats any non-baseball every time. How the Rangers hit against Cahill. How the Athletics hit against Jurado. Up in Nashville last few days and the rest of the week so missed the last couple games and ABs home run exhibition. But also missed Purees’ putrid puree. One of the nicest hotels I have ever seen there….Ever been to the Opery? I think with Beltre this year his hamstring injuries hurt his performance in several ways. First of all, they obviously made it harder for him to generate power at the plate and to be agile in the field. But they also prevented him from getting regular at-bats because this year, unlike in the past, the Rangers saw no need for him to play through his injuries or to return quickly because they weren’t contending and wanted to look at the young guys. So he never found his timing until recently, when they did let him play through the last hamstring injury because they’d seen all the young guys and they wanted him to get a chance to see if his hitting would come around to help both him and them decide if he should come back next year. If he does come back — and I for him would hate to see him retire when he can still hit this way — I hope it will be with the understanding that he has to get regular playing time, at least as a DH. And that’s even if, as is likely, he develops more injuries, as long as he feels he can play through them. Otherwise, his performance will suffer. Don’t know if you remember but I told you early on that ABs power was gone. Of course I remember, you said it over and over. I disagreed then and disagree now. His power is less than it was but the last week or so is proof that it’s definitely not gone. He just couldn’t get into a groove for the reasons I mentioned, and though he would deny it I’d bet that at some point even he began to wonder if age was taking a toll and lost a little confidence. Now it seems to be back and he’s hitting the ball hard regularly, which was always his trademark. As far as next year goes, a case could be made for letting Profar play 3B regularly. He’s hit well enough, with 16 HRs and a bunch of doubles and triples, and his defense, while not Gold Glove, is improving. So that complicates things, especially since they have a glut of corner OFers which means Choo is usually the DH. Oh and also his power has been dimished thru age as well. Father time waits for noone….his bat speed has dimished which translates into reduced power…..he can still hit but the HRs will not come back like they were. I do want to see Calhoun in LF, love his combination of BA, extra-base power, and contact. Not sure what to do with Gallo and Profar, but I suspect in time Profar will be the better third baseman. He was terrible at first, and his stats probably reflect that, but he’s improved. His build is more typical of a third baseman than Gallo’s, which suggests he’ll be more agile, but there’s always a question of his shoulder injuries will cause lasting throwing problems. Well one thing seems pretty clear: they are going to have to trade Choo or Profar or Gallo or Calhoun or Maz or Guzman over the winter. There just isn’t room for all of them. If they can’t make a deal for Choo then Profar may be the most likely to go. He becomes a free agent the soonest, at which time he might ask for some big bucks. Rangers don’t like to give away those. But given how little playing time they’re giving Calhoun, who turns 24 soon, it could also be him. Trade Gallo for a pitcher. They are looking good so far! It should be a fun year for our Sooners! As usual???? OU has to win the next 15 or 16 in a row just to get even in the Red River Rivalry. And you ALWAYS have to have the last word even when it’s BS. Even if OU wins 2 out 3 for the next 39 yrs they’ll still be STILL be behind in the Red River Rivalry. And they’ll still be Oklahoma. I think OU wins by more than that actually. But it’s nice for the state of Oklahoma to actually have something to brag about each year even if it is a professional football team for a university that ranks at #200+ something in academics. Even lowly Tulsa came in at #170. DeShields is leading off today. This Opener crap failed, this time because they should have stuck with the opener. Jurado . . . the next Perez. Last time it failed because they decided to pull him like he’d pitched 6 like normal but when he was doing well. That was all kinds of sad. Well when you walk the bases loaded with no outs and can only get a sac fly run it’s not like your offense is likely to produce well enough to win. Someone, anyone, STOP the carnage!! clear the bases and then it can end. Can TX not help Houston at least once??? Red Sox win on a walk off hit from Moreland.